“The only thing more cool than owning Mac products is knowing Eddy. Macs are exciting because they are so easy, reliable, fast, and intelligent. That's how we feel about Tech Me Back. Eddy recently replaced our MacBook Pro laptop's hard drive, added memory, installed new software, added a Time Capsule to our system, and recommended which iPhones to get. I have known Eddy for almost 8 years, and he is remarkable. He's ‘Mac Yoda.’ Aside from perfectly seamless, fast installs of hardware and software, he is infinitely knowledgeable with the technology. His customer service is refreshing! Everything you could want in a technician and businessman - Eddy is. He is so friendly and intuitively helpful, he knows what you are going to ask before you ask it. He is patient in his knowledgable, concise, and understandable answers. He is also super-fast with communications, response time, and flexible in scheduling house calls. In this day and age we are very discerning about access to our home or information, and have absolutely no reservations with Eddy. If he'd babysit, we'd have him! I cannot say enough wonderful things about his business ethics, knowledge base, and service level. He is the highest quality at reasonable pricing. When you find a great product, you just want to tell people to get one! I recommend Tech Me Back to everyone with a Mac. 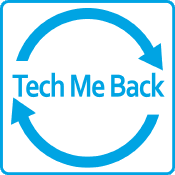 If new Mac products came with a choice of Apple Support or Tech Me Back, I'd probably go with Tech Me Back. The high standards Apple clients are accustomed to, right here in town! We were also about to make the jump to iPhones and had many questions about memory sizes, whether we should wait until the next release, how they'd interface with PCs at work, etc. Talking with Eddy is like Googling all your questions. He is so current on technology, how it works, and what trends to take advantage of, plus the basics of what you'll really need and use. On Eddy's recommendation, we went one level up on our iPhones, and are SO GLAD we did. He had said we'd be surprised at how much data/space you'll use - and he was so right! Thank you for the solid advice and encouragement to step up!